Pruning trees can be difficult and dangerous work. Improper pruning cuts can lead to irreversible internal decay of trees, improperly anchored new growth, and weakening of branches. Topping is the most harmful pruning practice. The indiscriminate cutting of branches to stubs is known as “topping”, “heading”, “tipping”, “or “rounding over”. This practice is often used to attempt to reduce the overall size of the tree. Reduction of size is typically sought out to try to reduce risk or because one feels the tree has become too large for the property. But topping increases risk and can lead to decline or death of the tree. It also reduced the aesthetic value of trees. A tree that has been topped will never fully regain its natural form. Leaves are a tree’s food factory. Removing them can starve and stress a tree, triggering a survival mechanism. Topping can remove 50-100% of a tree’s leaves, forcing the tree to produce a new crop as soon as possible. The tree will produce multiple shoots below each topping cut, these shoots are only anchored in the outermost layers of the parent branch and are weakly attached. Small shoots are prone to breaking and add weight to a declining tree, leading to more risk of limb failure. The thousands of leaves a tree produces also protect the branches from sunlight. Removing leaves can make the remaining branches susceptible to sunburn to the tissues beneath the bark, causing cankers, bark splitting, and possible branch death. The cost of certified arborist and a reputable company may seem daunting. But the long-term costs incurred by improper pruning can be much more than an initial investment in a professional. 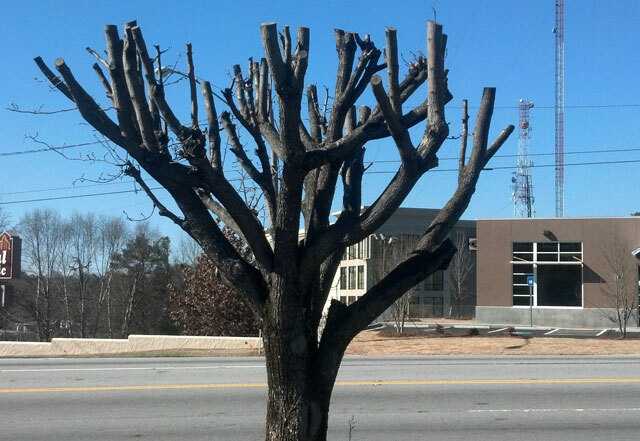 If a tree survives, it will need corrective pruning for several years to keep it healthy and safe. If It does not survive the cost of removal is usually higher than pruning. Disfigured trees also lower property value; a yard of healthy, well-maintained trees can add 10-20% to property value. There is also risk to people and property below a topped tree with decaying or dead branches. If you feel your trees are too large for your property one of our specialists can asses your needs and get the job done the right way, the first time. One of our arborists can help you decide how to properly prune your tree without risking the health of the tree, safety, or incurring long term costs of repairing damage. ← Why Hire a Professional Arborist?